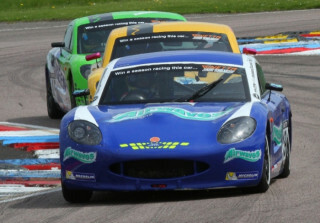 Jack went to Thruxton for rounds 5&6 of this year's Ginetta Junior Championship hoping to add to the four consecutive victories achieved so far this season and topped the practice times in the opening session on Saturday morning. Qualifying after lunch saw Jack secure 2nd on the grid for race 1 and pole for race 2. 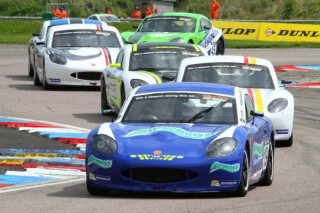 Race 1 was held on a dry track later on Saturday afternoon, but unfortunately for Jack his race didn't last very long. Some contact in the pack immediately behind him saw one of the other drivers edged into the grass and out of control. He came back onto the track at just the wrong moment for Jack and hit the Airwaves backed car as Jack turned into the corner at the start of the Complex. The damage was sufficient that all Jack could do was limp round to the pits to retire, bitterly disappointed but not at fault. The JHR Developments crew set about repairing his damaged car ready for the following day. Race 2, held before lunch on Sunday, again saw a dry track and sunny conditions for the Juniors to do battle in front of a packed crowd. A good start from pole saw Jack disputing the lead into the Complex for the first time, before slotting into 2nd. However, a couple of corners later he found himself relegated to 4th as one driver forced his way past and another followed while Jack was slightly unsettled the the first move. He regained his composure and moved back up to 3rd on lap 2, before gaining another place on the next lap to run 2nd behind eventual winner Jamie Caroline. The battling in the lead group was very close, with the circuit lending itself to a fast 'slipstreaming' race. Jack slipped back to 3rd on lap 5 and was still there, in the middle of the squabbling pack, as they started the last lap. A good move early in the lap saw Jack through to 2nd and close behind Jamie. 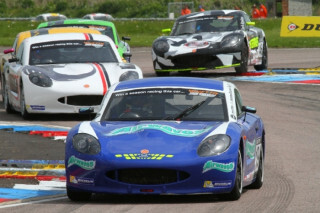 He decided to try to take the lead as they made the fast run up to the Chicane which constitutes the last corners at Thruxton but, with Jamie defending the inside line, it meant Jack had to make his move on the outside as they raced towards the corner. Leaving his braking as late as he dared he turned into the corner, but this pitched the car into a spin as the rear end 'came round'. Regaining control as quickly as possible, having not hit anything at all, Jack rejoined the track but had lost a few places and took the chequered flag down in an unrepresentative 6th place.